Modular Access Systems, LLC supplies bulk loading gangways, access bridges, stairs and ramps for your loading racks and platforms. These access solutions can be configured with a new loading rack and platform or retrofitted to existing equipment. 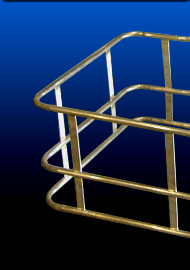 Our modular design makes gangway replacement, ramp replacement or safety stair replacement fast and easy. 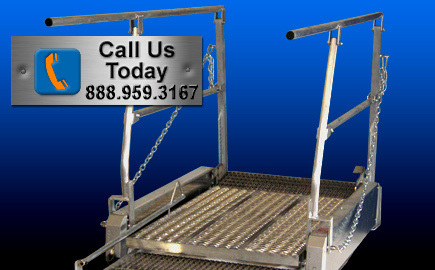 Our gangways, access bridges, stairs and ramps are rated to 300 pounds and can be mounted in fixed, pivoting or track-mounted configurations. 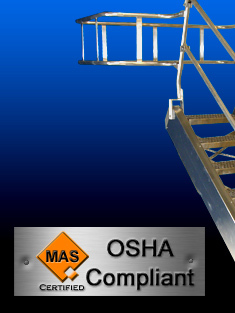 For additional safety, one of our optional enclosures will help you follow standard OSHA guidelines for fall protection. This is our painted steel flat ramp gangway with a slip resistant walk surface, fitted with a three rail 4' x 6' x 42" safety cage. This gangway is has a working range of 10 degrees up and 10 degrees down. It is popular for railcar applications and is typically used for a accessing vehicles with a standard fixed height and reach. Available in 24", 36", 48", 60" 72" widths and 3' 4' 5' 6' and 7' lengths. Your choices of materials of construction are aluminum, galvanized steel or stainless steel. This is our fixed reach flat ramp gangway configured for trucks. Our client is using this to access the tops of asphalt trucks. 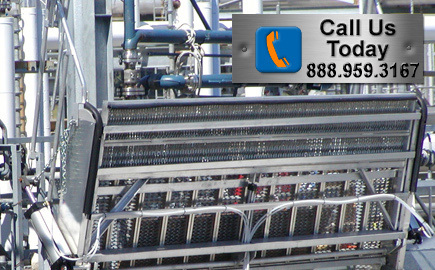 The three rail 4' x 6' x 42" safety cage creates a safe working environment for the operator. Our client chose this particular solution because the operators are accessing a dedicated fleet of trucks which have no variance in height or width. This model gangway has a flat ramp with a slip resistant walk surface. It features a telescoping extension on the end. 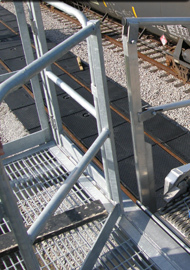 This gangway has a working range of 10 degrees up and 10 degrees down and is typically used for railcars with a fixed height which is close to the height of the loading platform. The extension creates a safe, ergonomic access path to narrow railcars and is typically not necessary for wide tank cars. 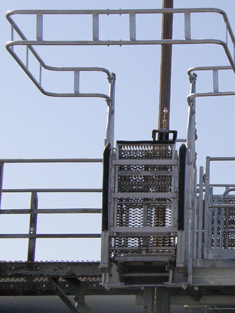 This gangway can be fitted with a 2 rail 7 x 7 safety cage for railcars or a 4 x 6 three rail safety cage for trucks. This gangway access bridge is available in 24", 36", 48", 60" and 72" widths and 3' 4' 5' 6' and 7' lengths. 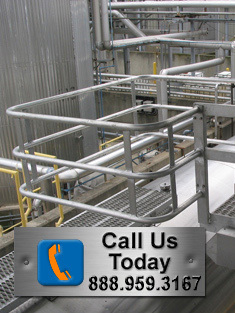 Your choices of materials of construction are aluminum, galvanized steel, painted steel, powder coated aluminum or stainless steel and can be equipped with a FRP walk surface. This is our ramp gangway with an extendable walking surface configured for use with railcars with a safety yellow powder coated finish. 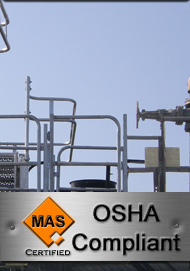 The gangway and the two rail safety cage create a safe working environment for the operator. The gangway in this case will store in a 90 degree, upright angle but the safety cage will remain horizontal throughout the travel of the gangway. This is our aluminum self-leveling tread stair gangway. 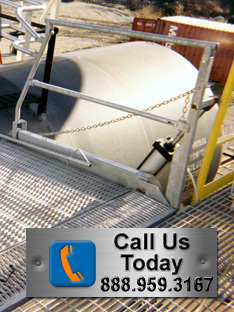 This gangway is typically used to access tank trucks or railcars that vary in height. The self-leveling, articulating treads stay parallel with the ground no matter what height or angle the gangway is positioned. This gangway stair can travel 45 degrees up and travels 40 degrees down. 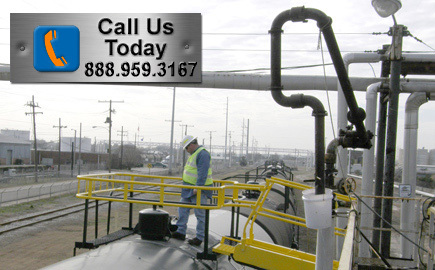 It allows the operator safe, ergonomic access to the top of variable height tank trucks and railcars. 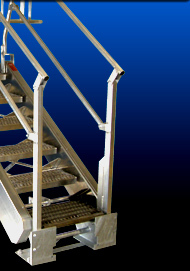 This gangway safety stair unit is available 24" 36" 48" 60" and 72" wide and 3 1/2' to 7 1/2' lengths. Your choices of materials of construction are aluminum, galvanized steel, painted steel, powder coated aluminum or stainless steel. This is our self-leveling tread gangway configured for a truck application. The gangway is fitted with a three rail 4' x 6' x 42" high safety cage. 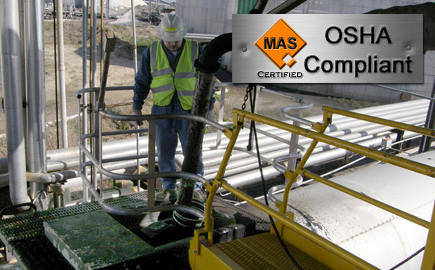 The gangway and cage create a safe working environment for the operator of the tank truck. This particular gangway tracks up and down the platform, allowing the operator to access any hatch or vent along the top of the tank truck. This is a tracking gangway for rail cars. We have retrofitted the new design on an existing rail loading platform. The gangway is designed to track up and down the face of the platform in order to compensate for mis-spotting of the railcar. The new handrail that you see are actually swing gates that open only one way and are sprung so that they close automatically. If the train is mis-spotted, the operator slides the gangway to the appropriate swing gate and is provided with ergonomic, safe access to the manway of the crash box. This is our swing gate in operation with a tracking gangway. 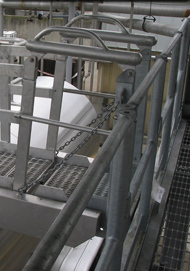 The gate only opens when pulled toward the platform so it acts as a positive handrail from the perspective of the operator on the loading platform and thus provides fall protection. The gate is spring activated and returns to the closed position automatically but is not latched for easy egress in case of emergency. This is a 12 foot wide flat ramp pneumatically operated gangway with extension in its stored position. This gangway is being used to access rail cars. The gangway is fitted with a two rail safety cage that raises the handrail to the OSHA required 42 inch height for elevated work surfaces. All operations of this gangway are assisted by pneumatic cylinders. The client chose this wide gangway over a 24 inch tracking gangway to counter spotting issues because it allowed much easier access and egress to the hatch area of the railcar with multiple hoses and tools. This is a six foot wide pneumatic gangway with extension. 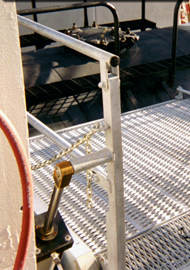 The platform of the gangway can be made in stainless steel, painted steel, aluminum or galvanized steel. 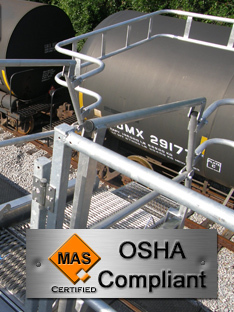 The extra width of the gangway addresses railcar mis-spotting, which is one of the most prevalent causes of accidents in loading and unloading and is one of OSHA's primary concerns. This gangway uses an automatic power unit, either hydraulic or pneumatic, to raise and lower the gangway due to its size and weight. 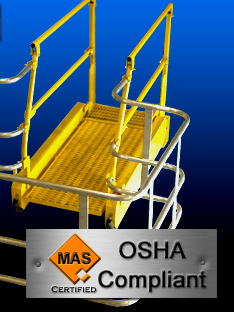 The safety cage used here raises the handrail surface on the railcar to the OSHA regulated height of 42 inches.